VERY important: You have to realise that carbohydrates are no longer your friend (if they ever were), because as we get older, our insulin automatically (like everything else!) goes south – or rather in the case of insulin, becomes less sensitive. This means more insulin is produced, and the more insulin you are producing the more fat you are storing around your belly. You have to now ‘break up’ with carbs like bread, sugar, alcohol and dairy if you want to remain slim and relatively symptom free. 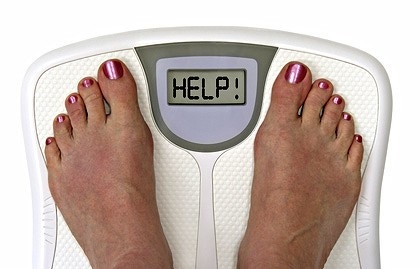 Yes, it sounds hard – but it’s harder to carry around extra weight and be miserable. If you are one of the lucky ones who has sailed through menopause without this problem, you may well sit there and laugh at the rest of us – not many people escape this middle-aged spread story… But you are blessed if you can still indulge in all your favourites, and still get away with no weight gain. We are all very envious…. Around this time of life, women are put onto hormone replacement therapy (HRT) very often – synthetic hormones which build fat and predispose you to cancers. So right here, think very carefully before you embark on any kind of HRT. There are safe natural things you can use and there are herbals (some are good some are not) – knowing the right thing to do will help you immeasurably through the coming years not only with weight gain, but bones, heart and other symptoms. This would be an entire article on its own. Our own natural estrogen in our youth is very different to the synthetic estrogen given to us in menopause! Extra stress at this time of life – empty nest syndrome, divorce, changing homes, elderly parents, illness, poor diet, the loss of a loved one, laat lammetjies – all contribute to how our hormones react. Very often around this time you are dealing with a teenager at home, one child is about to get married, plus you are dealing with aged parents needing attention. There is simply no time for you! This is a huge part of the equation. Stress leads to excess cortisol being produced by the adrenals, which then builds a spare tyre round the middle. Stress, perhaps marital stress – your husband could be going through a mid-life crisis, you’ve both perhaps lost your libido which adds extra strain, or he may be travelling more on business – or been retrenched, adding financial stress to the mix. A retired husband around the house can either be a blessing or an extra burden depending on how he reacts to retirement, and this may give you even less time to yourself than ever before – it can be like having another teenager at home. Having a husband around the house can be wonderful too – so don’t dread it if it’s about to happen. You will have more time together than before which can be just what you need. You naturally experience fatigue at this time of life (don’t worry, it passes! ), and you could end up reaching for processed food or ready meals from sheer exhaustion – and turn to sweet things and alcohol to comfort and relax so you get through the day. All a big mistake. You need to ALWAYS be cooking your own food from scratch, and eating REAL food. This is a secret hiding in plain sight – eating real food every single meal you possibly can. And if you need an afternoon power nap, take one – it can refresh you no end. Estrogen is not the only hormone which is affected. As estrogen declines, so cortisol is elevated, thyroid hormones may be affected, and then there is insulin and leptin. Your body is undergoing a complete hormonal shift – be kind to yourself and realise that this is something that you can control up to a point with lifestyle and diet, and by saying NO to more outside requests so that you have the time and stamina for things you need to do for yourself and your family. Insulin is the hormone responsible for decreasing circulating blood sugar – it’s necessary and wonderful when it “works” properly. But to keep a balanced level you absolutely have to dump the sugars and grains and anything which is high in carbohydrates. (My book The Low-Carb Creed outlines all this with lists and ideas for you). More carbs means more insulin, which means more fat storage, and perhaps insulin resistance, which is a decreased sensitivity to insulin, and a precursor to diabetes. Insulin resistance leads to weight gain, possible high blood pressure and raised blood lipids – even the dreaded fatty liver – so it’s it is important to either not let this happen, or address it now and reverse it. Cortisol, our main stress hormone, increases blood sugar levels providing fuel to the cells to provide energy. Very high blood sugar levels lead to cortisol resistance and adrenal fatigue, as the adrenals are unable to keep up with the demand for more and more cortisol – all this leads to weight gain and no energy. Thyroid hormones dictate how much energy the cells of the body can produce – when the levels of hormone increase, it tells the body to burn fat to produce cellular energy (ATP). Compromised thyroid hormone levels will prevent burning carbs and fat, and lead to weight gain. Leptin is the hormone our fat cells produce to tell the hypothalamus in the brain that we have had enough to eat, thank you. Too much fructose especially leads to leptin resistance where the messaging system stops working, the brain doesn’t get the message that you are full, you remain hungry and continue to eat more and more to satiate yourself. Stay active – exercise on its own won’t help you lose weight, but it does help to prevent muscle loss and helps to sensitise insulin. You don’t have to run a marathon or spend all day at the gym, just a walking every few days or an hour or so is enough. Keeping your digestive system working well is another key to good health not only in menopause but throughout your life. Eat organic vegetables where you can, pasture-fed meats and chickens, eggs from pasture-fed chickens, and game. Ditch the sugar, alcohol and junk and concentrate on really fresh, healthy foods. Avoid chemicals on your face, when cleaning your home, washing your body and your clothing – wherever possible, choose natural alternatives to chemicals. Look around your home – you’ll be horrified at how many chemical substances you use every day. Avoid genetically modified foods, avoid man-made fats and oils – stick to animal fat and olive oil, butter and other healthy fats – and don’t touch any seed oils. They are inflammatory and will put on weight. Healthy fats will not. Vitamin D3 – really important for 1000 reasons! And then there are the targeted nutrients and specialised supplements you’ll get under the direction of a trained Functional Nutritional Therapist (you can do this by going to my Health Evaluation button on my website). All of these products are available from the online store on my website at here – use the “search” button if you get stuck finding them.